I guess by now you can see that I carry a lot of “girly” things! ~ Jewelry, vintage hats and accessories, dainty flowery china, etc. ~ But! I do have guy stuff for sale, too! There are several vintage Harley Davidson items, including a great motorcycle cap that Marlon Brando would’ve been proud to wear! With it’s “Stove Pipe Wells” (a spot in Southern California) charm bracelet across the front of it, I’ll bet it has some great old riding stories to tell. Motorcycle run pins are usually only available if you’re a participant in a motorcycle event, so they are very collectible. I have some from the “50s and some more recent so there are lots to choose from here. By the way, the photo of the G.I. on the motorcycle is my dad! Another favorite of the guys (and gals) are antique bottles. You want bottles? I’ve got bottles!! My husband Rick is the “bottle guy” in our family; a collector, author and digger of beautiful old glass. He helped me with my inventory of some really great old bottles. Whiskies, medicines, sodas and bitters bottles ~ what beautiful colors! So, gentlemen-please don’t hesitate to walk through the front door! Vintage Gal Antiques has something for you, too! And, if you’re looking for a gift for a gal, I’m sure you’ll find something special here! 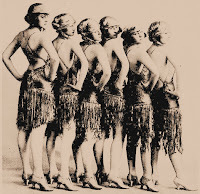 There is something mysterious and glamourous about the "flapper" era. 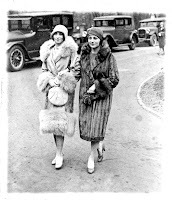 I've always loved the fashions and furs worn during those days. At Vintage Gal Antiques, there is a great selection of photos, jewelry and accessories reminiscent of this period. Stop by and check it out! Hair receivers were a common item found on Victorian ladies dressing tables. The purpose was to save hair from hairbrushes and combs and then use the hair for various things. It could be used for pillow stuffing or pincushions. Hair jewelry was also very popular. Lockets, watch chains, mourning brooches and bracelets were created from hair. Kind of creepy, but very fashionable! In the late 1800's and into the early 1900's, postcards and valentines were often sent with hair attached. It was considered a sentimental token of affection. Most hair receivers were made with a hole in the lid to poke the hair into it for storage. Hair receivers were usually made from porcelain, silver, celluloid or crystal. Hand painted porcelain receivers are extremely beautiful to collect. There are several hair receivers available for sale at Vintage Gal. Once you begin to notice hair receivers in different shops, you will see there were many designs! Prices are still fairly reasonable for this interesting collectible.